In this Tech Note you will learn how to configure CasaTunes to seamlessly integrate with your single or multi-zone A/V Receivers in a whole house music solution. In this example, we will seamlessly integrate and control a Denon 2-Zone A/V Receiver over the network (using TCP/IP). The Main Zone on the A/V Receiver will power the Living Room, while Zone 2 on the A/V Receiver will be used to power the Dining Room. The integrated solution allows the user to use any of the CasaTunes Apps for Android and iOS, the CasaTunes Keypads, and all the CasaTunes home automation and system control drivers, to control the music being played in the Living Room and Dining Room. From the homeowner's perspective there is no difference controlling the Living Room, Dining Room or any other room in the home. This CasaTunes-based solution is also matrix amplifier agnostic, and works equally well with matrix amplifier systems from CasaTunes, Audio Authority, ChannelVision, Nuvo, Russound, RTI, SpeakerCraft and other supported 3rd party matrix amplifiers. While this example illustrates how to integrate a networked Denon A/V Receiver, CasaTunes also provides built-in support for A/V Receivers from Denon, Harman Kardon, Onkyo, Marantz, Pioneer, Sony, Yamaha and more, using RS-232 or TCP/IP. In addition, CasaTunes and installers can add support for additional devices through the creation or modification of the CasaTunes XML Control Modules. Most Multi-Zone A/V Receivers are capable of being controlled either via infrared (IR), serial (RS-232), TCP/IP, or any combination of these. With CasaTunes, we provide support for controlling serial and IP based A/V Receivers. If the A/V Receiver only supports IR control, then you can use CasaTunes in combination with Bitwise Controls, or a Global Cache IP-to-IR device, to provide similar capabilities. If you are using serial or RS-232 to control the A/V Receiver, you will need to connect a USB-to-Serial cable (not provided) from the CasaTunes music server to the serial port on the A/V Receiver. In this example, since we are communicating with the A/V Receiver via TCP/IP, you need to make sure the receiver is connected to the network, and you should configure the network settings for your AV Receiver. Note: You must enable Network Standby mode, or something similar, in your AV Receiver. When in network standby mode, the AV Receiver is capable of receiving connections from the CasaTunes music server even when the AV Receiver is in standby mode. Check the AV Receiver manual for more details. Note: To setup a static IP address using the DHCP server in your router/modem/switch, you will need to have the credentials to login to the router/modem/switch. The next step is to connect the pre-amplifier outputs from your CasaTunes 6X6 matrix amplifier to your AV Receiver inputs. In this example, we connect the pre-amplified output from the Living and Dining Rooms, to the AV Receiver CD and DVD analog inputs, respectively. These connections typically require RCA stereo cables (which are not provided). 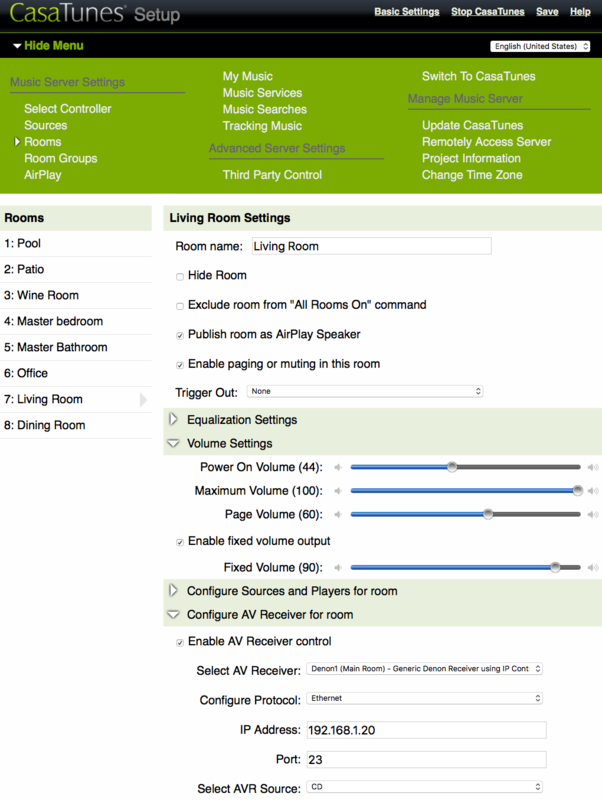 After you have completed the hardware connections, you must now configure the room in CasaSetup to use an AV Receiver. For the Living Room, select Denon1 (Main Room) - Generic Denon Receiver using IP Control. For the Dining Room you would select Denon1 (Zone 2) - Generic Denon Receiver using IP Control. The Port will be automatically set for you. Do not change this value. When you enable the Fixed Volume option, CasaTunes will always output its music to your A/V Receiver at this fixed volume level. Now, when you change the volume, CasaTunes will issue volume commands to your A/V Receiver to adjust the volume. Ideally, you should adjust the fixed volume value so that it matches the volume levels of the other sources on your A/V Receiver. To test your setup, grab your CasaTunes control device and switch to the Living Room. Power on the room and you should see the A/V Receiver switch on, and the input source switch to the CD input. You should also be able to adjust the volume in the room using the volume slider. Now, switch to the Dining Room and repeat the same tests.